It is hard to imagine that a year has come and gone with Andrew. He has changed our lives and made it better than we could have ever imagined. So I thought I would reflect on the changes to our life and to Andrew's in the last year. The first and the most obvious change is that when Andrew came home he knew the ABC song and that was it. I am sure it was scary to only hear sounds that didn't make sense. Now Andrew answers the phone with permission, talks up a storm and loves to count and identify letters. A few weeks ago he asked to make a grocery list. He wrote it on his own with me giving him the sounds it included OJ, yogurt, bananas and hot dogs. Also as we rode to Nebraska and Andrew ask why and how far a million times we played counting games and letter games. It is hard to imagine a year ago there was only the ABC song. He sang before he spoke and now we think about verb tenses and pronouns. Oh how a year changes things. One thing that most people don't know is that Andrew was deathly afraid of dogs when he came home. So scared that as we would drive down the hill to my parents that he would start crying. To some extent he felt this way about cats but not to the extreme of dogs. So we began what we jokingly called dogie therapy. Thankfully my parents/Gabe's dog is one of the mellowest dogs known to man. So we would put up the baby fences and put Tina in the living room. Aaron loved the dog so we would put Aaron in with Tina and then hold Andrew in the kitchen so he would be safe. With time he progressed to sitting by the fence and then petting and finally spending time in the room with Tina. Now we have the other problem. He thinks all dogs are friendly and should be petted and played with of course. The Lord is good. This was a very serious fear and I do not know if we would have aggressively addressed it if no one in the family had had a dog but they did. Andrew not only had to deal with a new home but face a big fear. Also Aunt Cindi's dogs helped with dogie therapy too. Andrew introduced cars to our lives. Aaron was pretty neutral in the car department. Aaron liked to be read books and play with animals and musical instruments. Andrew loves anything with wheels and he wants to know how it works. As he learned to talk road signs and directions were some of his first clear communication. Ask grandpop about his back seat driving. In this vein he loves directions and seems to have a gift for maps and understanding them. At least one member of the family won't get lost. Andrew from the moment he stepped off the plane accepted Aaron as his brother and Aaron didn't feel threatened by the new sibling. Life got louder after Andrew came home. He is a mover not a sitter generally. Andrew loves to play chase and be outside going and going. Great grandpop made his day by allowing him to drive the cart and Mr Bob has taken him on tractor rides. As we speak he and daddy are riding the lawn mower. Aaron is an observer and Andrew is a doer. Aaron is more willing to try new things but Andrew is more willing to meet new people. Andrew wants to be funny. I don't know if this is from all the Muppets we watch or not. I suspect when he gets a better grasp of the English language we will be listening to lots of jokes. Andrew loves to play chase and ride his tricycle. He loves hide and seek and any excuse to hit or kick the ball. I could spend hours telling you of the changes he has brought but most of all he has filled my heart to over flowing again. It was full when Aaron came home and yet it is fuller still now that Andrew is home. God chose him for us and daily I am grateful. I am thankful for foster families that loved him and prepared him to come home. For caregivers in his life. I am grateful that his birth mother made tough decision that has blessed me beyond measure. I love him so much and he is mine. By no means is everyday perfect but Andrew with all that makes him unique is perfect for me. I love you. 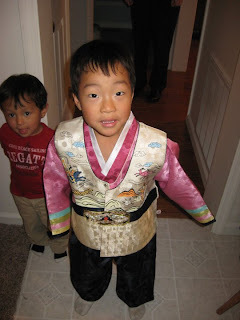 Note the picture of Andrew is in traditional Korean attire that was given to him by his foster mom(Korean Oma). It is to be woren on special occassions such as birthdays and the chinese new year.